These pillows are perfect. Exactly what I was looking for as far as firmness. The real test will be how they hold up but I do anticipate they will do well. This set of four pillows from Hotel Madison features Truloft feathers, which are washed up to eight times. 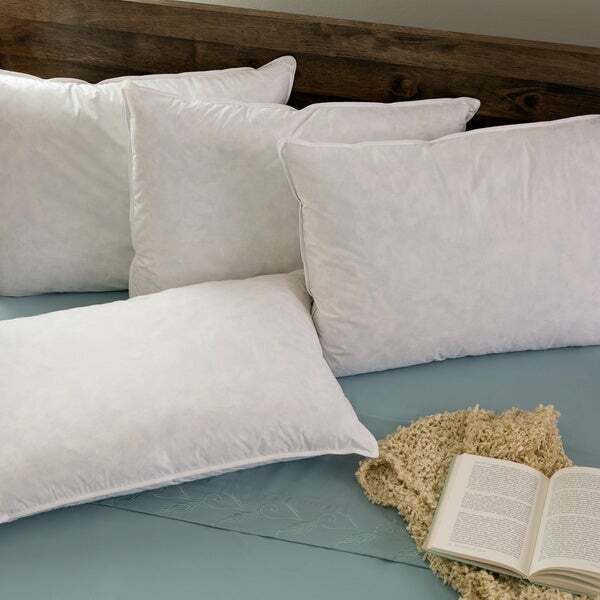 The pillows boast a 230 thread count for added comfort. These pillows were an excellent find. I purchased two sets and I am glad to have them. They are firm yet malleable; much better then synthetic fibers. These pillows fit standard shams. I would highly recommend this product. I like these pillows. They arrived on time and were well-well packaged. No odor on coming out of the box, so no need to air t hem out. Be aware that they are really stuffed full of feathers, which makes them a bit stiffer than some feather pillows, and a bit harder to conform to one's head than your favorite old smushy down pillow. I put two on my queen guest bed and two on my king bed, adding to a couple of other flatter dwon pillows. Great for support propping yourself up in bed if you are a "read-before-going- to-sleep" person. Would buy them again. Been shopping for pillows for some time. These are very nice and good price. Not too firm and not too flat. This is my second purchase of these pillows. My first purchase was for the standard size. They are nice and fluffy and provide me with maximum comfort. They came as a set of four. I loved them so much, I purchased the king pillow set too. These arrived quick! They are filled to the max, like hard to get my pillow cases on, but a good problem to have knowing they are so fluffy. The feathers poke through once in a while, but overall, we love these pillows. Great value for a feather pillow. Would buy again. THE RATING FOR THE PILLOWS WAS A 1 BECAUSE THE PILLOWS HAD SOME REALLY BAD ISSUES. HOWEVER, OVERSTOCK CUSTOMER SERVICES AFTER MY SECOND CALLS PUT THE CUSTOMER FIRST AND HANDLE THE ISSUES WONDERFULLY. THE PILLOWS WERE DISCARDED AND MY ACCOUNT CREDIT BACK. THANK YOU OVERSTOCK CUSTOMER SERVICES THIS RATING IS FOR YOUR ASSISTANCE! Best feather pillows ever. I’m a pillow snob and these are amazing. They do loose a feather or two occasionally when I change the pillowcase, but that’s the nature of feather pillows. They conform to any sleeping position and fluff back up in the morning. These are great pillows. High quality- no feathers poking out. I look forward to my head hitting these pillows every night. These pillows are amazing. They're very fluffy so if ur a back sleeper they're perfect, if a side or stomach sleeper not so much. They are very comfy and they fit in my pillow shams amazingly! We use them for stand up pillows for the bed. My husband on the other hand sleeps on one at night and is in love with them. Definitely a good buy! A couple of them have developed small holes at the end which lets feathers out. I sewed them closed again which has prevented any further loose feathers. Good for the price. Beautiful comfortable pillows at a great price for set of four. Okay, I’ve paid LOTS MORE in Past for 1 Pillow and Took a Chance on these, based on Reviews. Just Got Rid Of The Other Expensive Pillows And PUT ALL 4 Of These On My Bed!! Not hard, Not Flat- JUST RIGHT!! Sleeping better, too. My mistake was getting feather pillows. I didn't read the product carefully. They started out thick and firm, but quickly flattened out once I slept on them. Just purchased these, so far we love them. Just right for me a side sleeper, and they fluff nicely. Awesome pillows are now almost 3 years old and still fluffy like they are new!! Would buy again.. that is if they ever wear out!! These firm pillows are great for those of us who want the feel of the feather pillow yet often find them less substantial that we’d like. "how many ounces of fill in king pillow?" "Can anyone give a recommendation on a mattress pad or foam/ gel topper that you find reasonable and also comfortable? Thanks so much for all your help.."
ITEM#: 15459547 has awesome ratings. "Is that 1 set of 4 pillows for 59.99?" This listing is for a set of 4 pillows. Yes, it's 4 pillows for 59.99 and they're great pillows too. U won't regret this purchase. Good quality pillows! My neck is killing me and I am hoping it will help to get new pillows. I thought this was a good deal and it will replace all my old pillows. I own a Bed & Breakfast and wanted to make feather/down pillows available to my guests. I haven't tried these particular down pillows yet, so I hope they live up to my expectations!